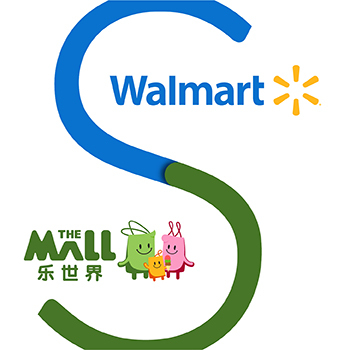 Walmart Asia Realty – a subsidiary of the world's largest retailer Walmart, number 1 company in the Fortune 500 for the past 6 years – asked Base Creative to create a comprehensive research, strategy, naming, branding and implementation program for its new shopping mall brand in China. 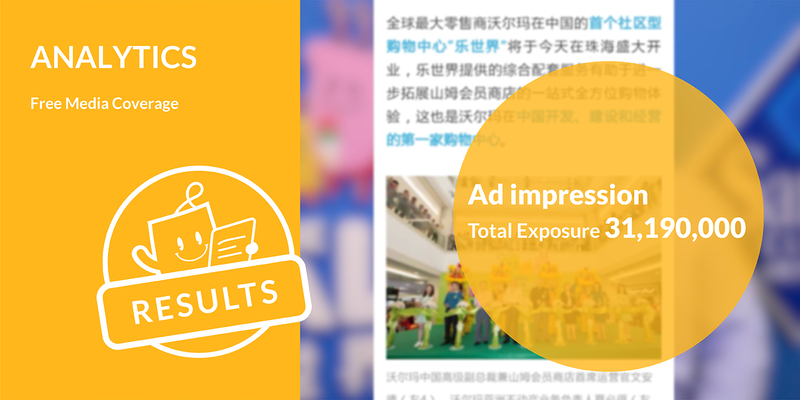 With our strong shopping mall insights based on extensive experience, combined with in-depth understanding of the Chinese mindset, Base Creative was a natural partner for this project. 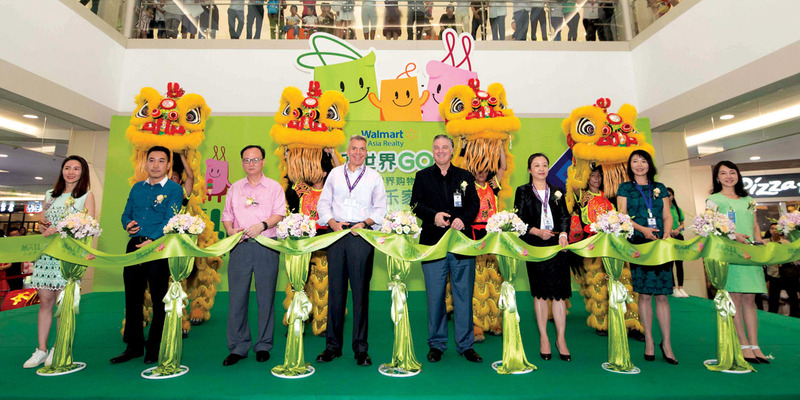 Already a major player in the China market with more than 400 stores, Walmart had a vision of a new kind of mall. 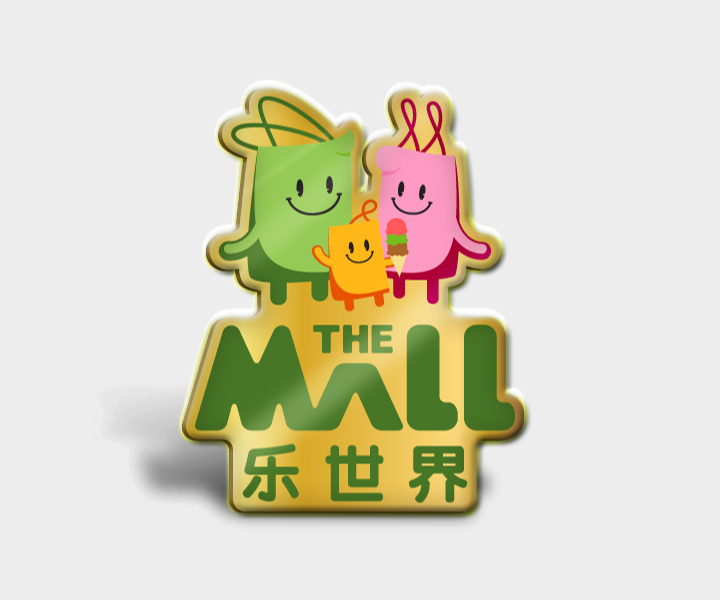 Unlike many in China which typically focus on high-end shopping in Tier-1 cities, The Mall is intended as a one-stop community center designed to serve the daily needs of local families in fast-developing lower-tier cities – not just for shopping, but for dining and a range of other services, with space for community activities. 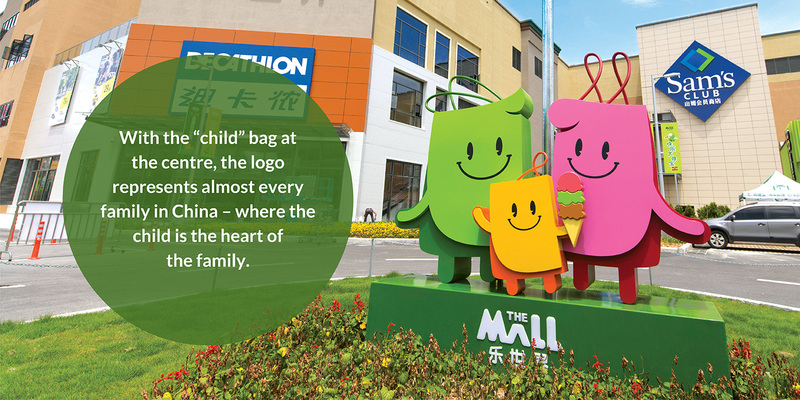 Base Creative worked closely with Walmart’s management team to flesh out this vision and redefine what a mall can be in contemporary China. 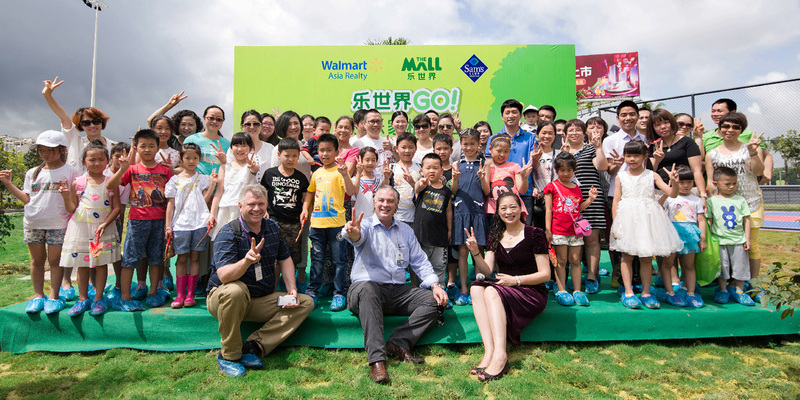 In doing so, we aligned our work with the Golden Principles which guide all Walmart’s developments, assisting Walmart to define how these would be implemented in The Mall. 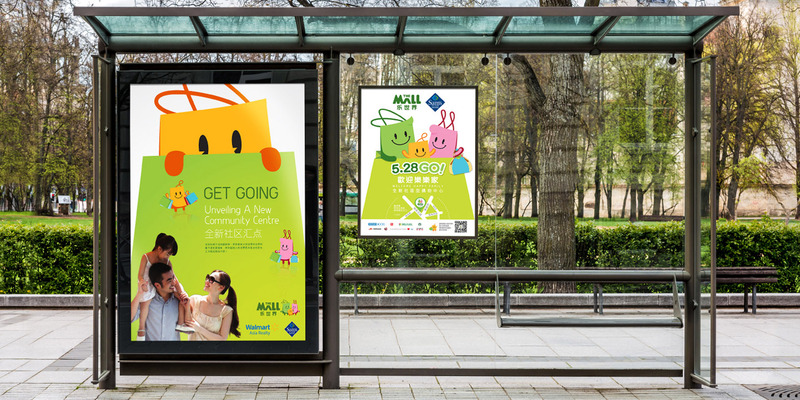 Walmart Asia Realty engaged Base Creative to provide market research, planning, brand creation, packaging design, and brand activation for its new integrated mall in Zhuhai, China – the first of a planned chain. Base Creative’s role in the project spanned research, strategy formulation, design, and event management for the grand opening. 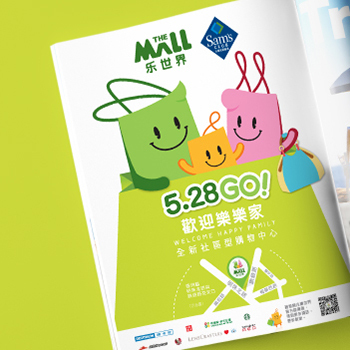 Through a series of extensive qualitative and quantitative consultations across tier 2, 3 and 4 cities, as well as competitive analysis benchmarking against family-oriented malls across the globe, Base Creative set out to question the idea of malls in contemporary China. 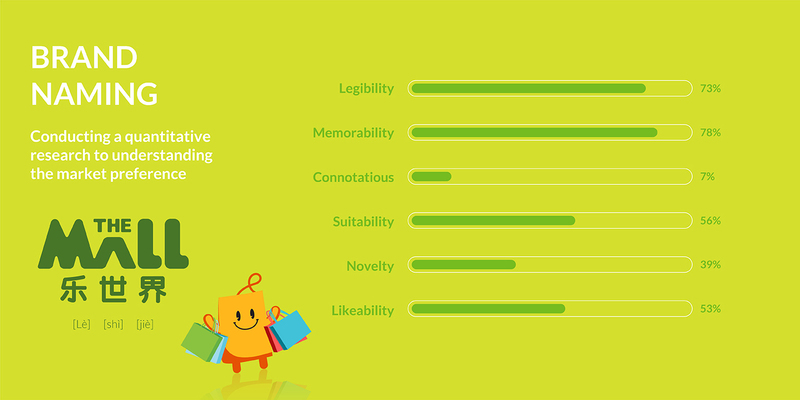 We conducted executive workshops to look for indicators of business needs and challenges, and held first-hand interviews with consumers who provided key insights about the cultural roots of shopper behavior. 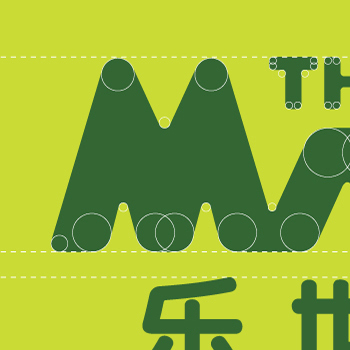 We learned that China’s increasingly prosperous middle class are seeking new experiences that go well beyond traditional basic shopping. A key finding was that as cities in China have grown at exponential rates, traditional communities based on villages which have existed for millennia in China have been displaced. 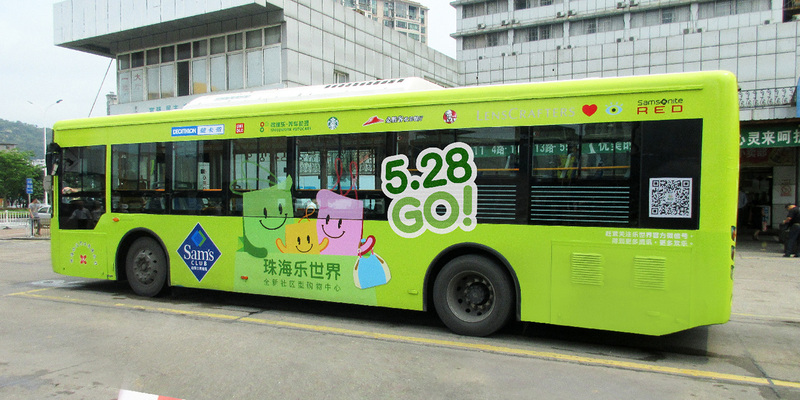 Together with changing demographics, such as an aging population, smaller families, and reduced living space for many people, rapid urbanization has brought a decline in traditional forms of social interaction, creating a greater need for new community spaces – public areas in which to congregate and socialize. 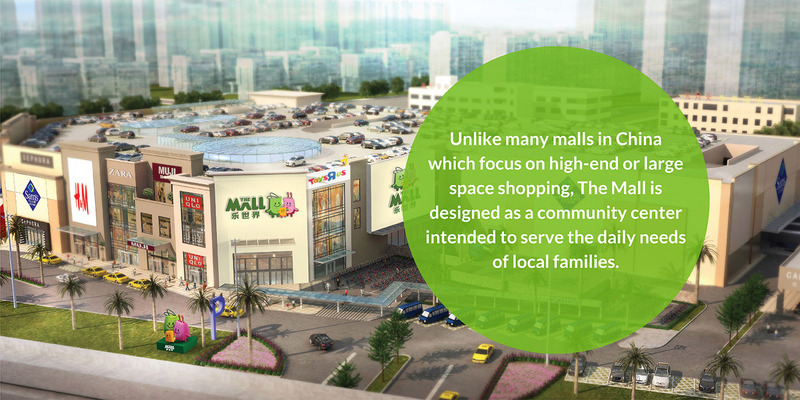 This insight informed the design of the mall, in which the proportion of public space was increased to meet this need. 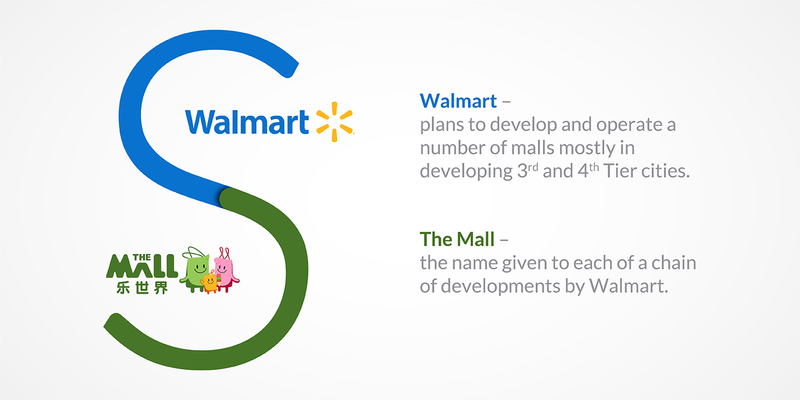 We prepared a range of names and potential logos that we tested through focus groups in tier 2-4 cities, helping Walmart decide on a straightforward and easily remembered name – The Mall – and the final logo and color scheme. 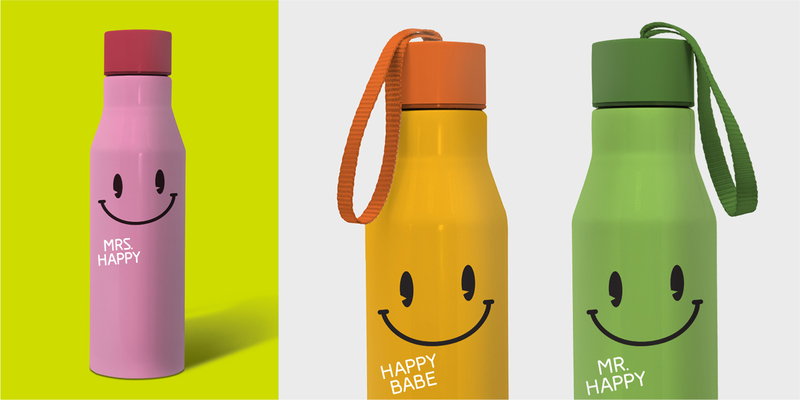 Based on the resulting insights, Base Creative initiated a top-down brand-building program designed to position Walmart as a provider of family quality time. 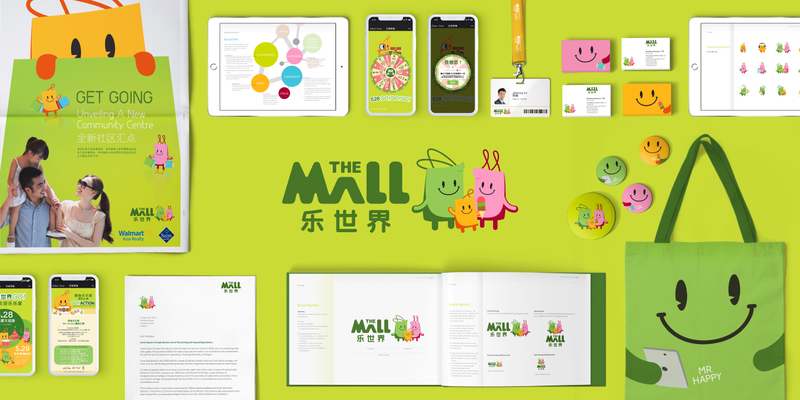 Inspired by the rising need for public social spaces, Base Creative worked with Walmart’s management team to refine its vision into a welcoming retail atmosphere with the right level of comfort – clean, colorful, and appealingly attractive on a human scale. This includes a spacious parking area with ample signposts, an efficient floor plan supported by easy navigation and well-planned signage, and scattered seating areas where tired shoppers can rest their feet. 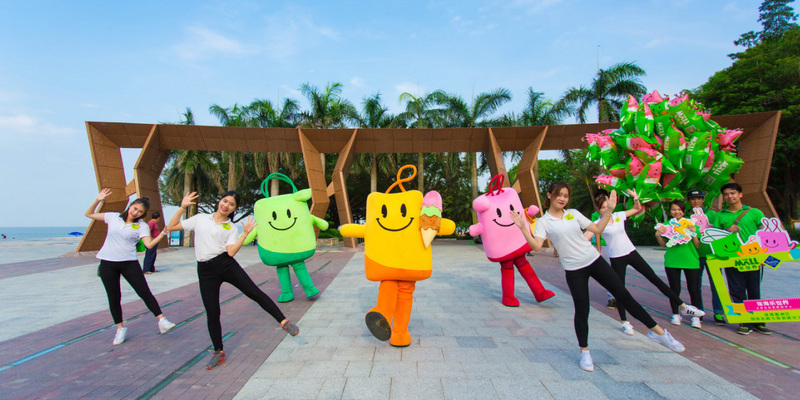 Central to this vision is the concept of The Mall as a family-oriented community center providing China’s growing middle class with not just shopping and dining facilities, but a space for meeting, entertainment, education, kids’ fun and just “hanging out”. Each Mall would deliver a one-stop shopping experience, anchored by either a Walmart store or, in more affluent locations, a Sam’s Club, Walmart’s membership-only warehouse scheme. 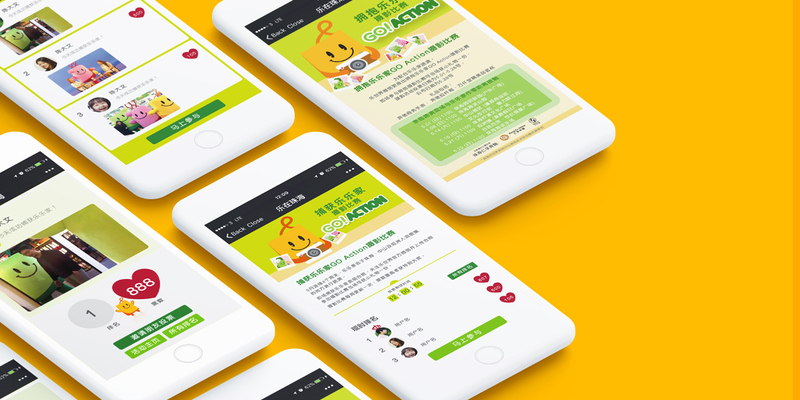 This would be complemented by a range of other retailers, both local and international, and a wide choice of food and beverage outlets, supplemented by services such as sports facilities, banks, medical clinics and other offerings to meet local needs. 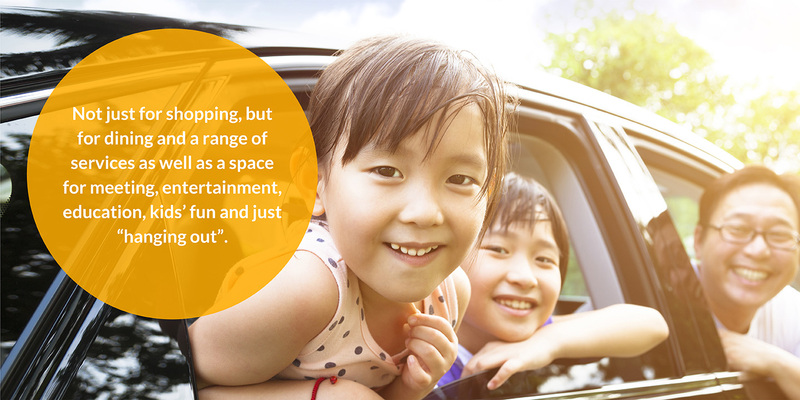 Selected sites would be easily accessible by local public transport as well as providing ample car parking. 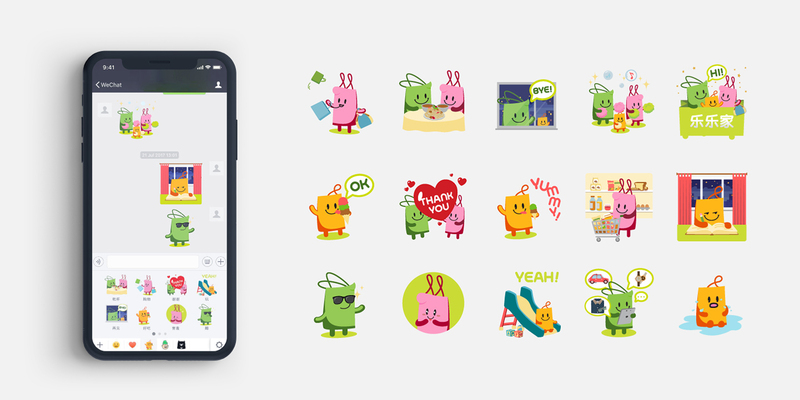 After conducting extensive consumer trend research, and focusing on the largest customer group, the family, Base Creative rethought some of the visual elements that could help to shape Walmart as the center of the local community. 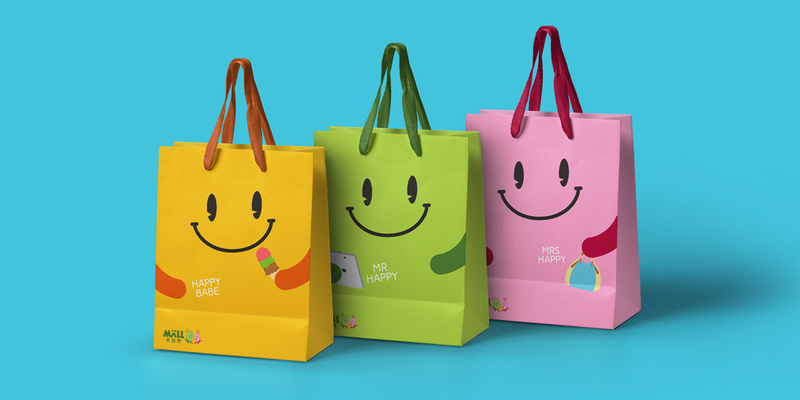 We designed three colorful shopping bag mascots – Mr. 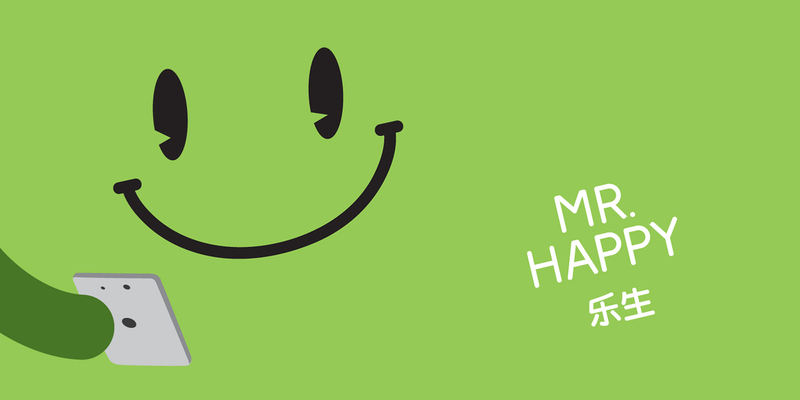 Happy, Mrs. 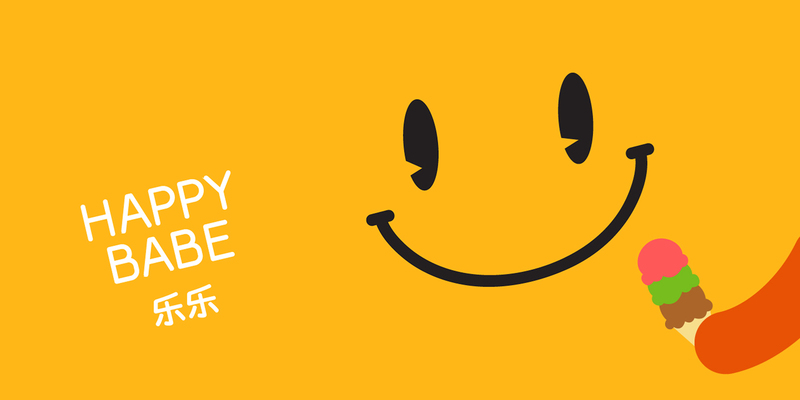 Happy and Happy Baby – as an archetypal "personality” with the child at its heart, representing a typical family in China. 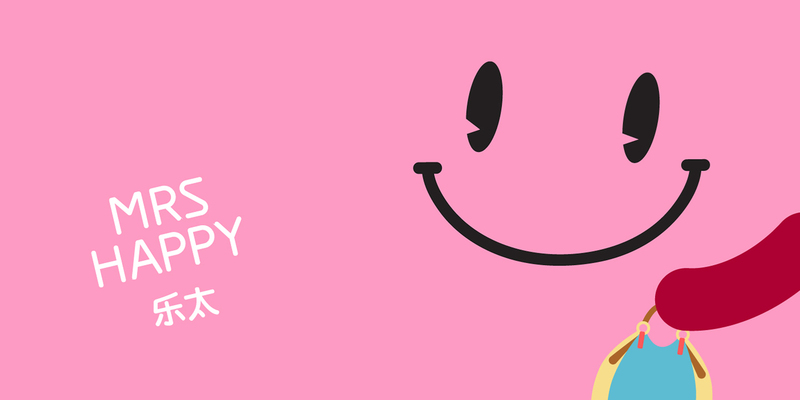 These were brought to life through animation for use in various media. 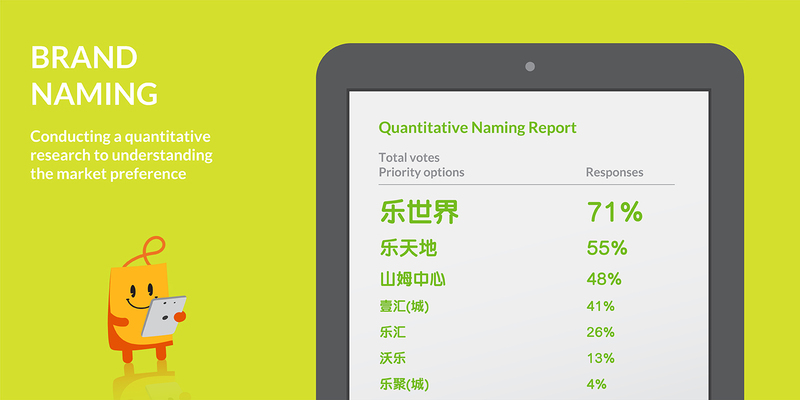 The brand needs to resonate across all areas and generations of China. 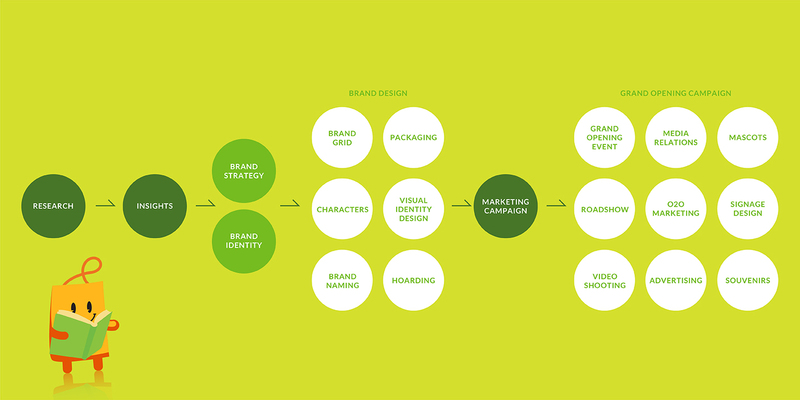 This overarching identity system – designed to achieve that objective – would inform all brand communications, from online banners to print advertisements to the architectural façade. 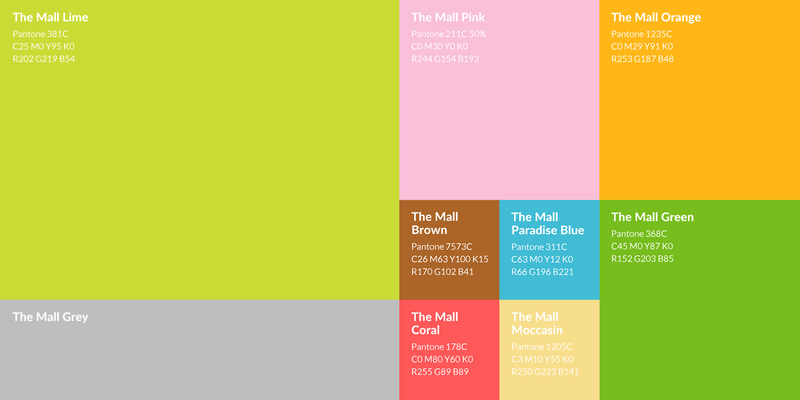 The interior of The Mall would be bright, fresh and colorful with easily navigated signage. 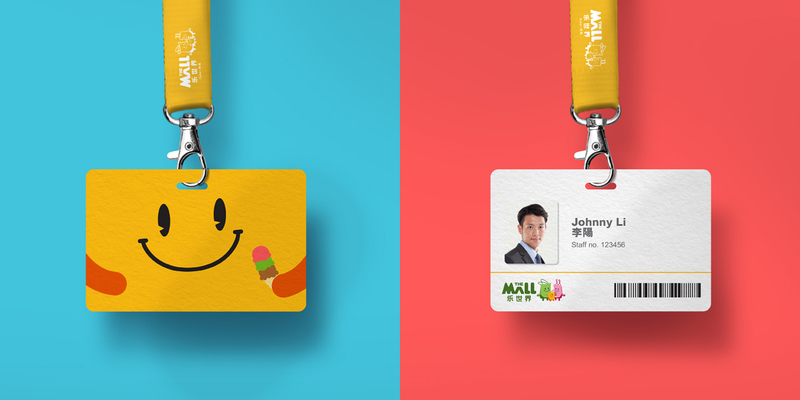 We extended the brand’s visual identity across all touchpoints from exterior signage to staff name tags. 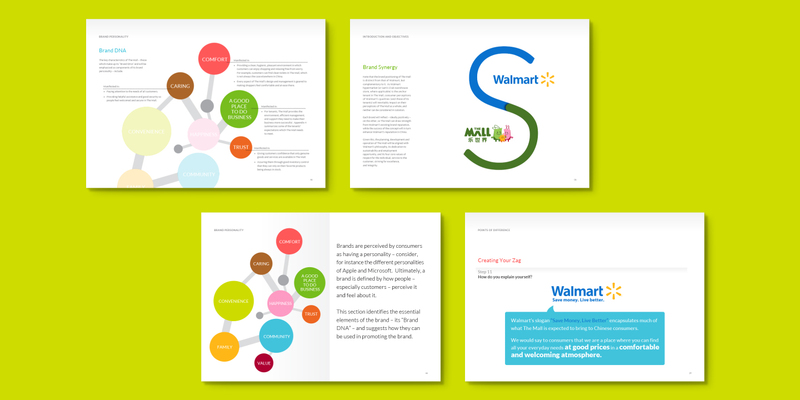 Brand identity also included a vibrant theme song, reusable shopping bags, font selection, and the theme color green symbolizing Walmart’s commitment to environmental sustainability. 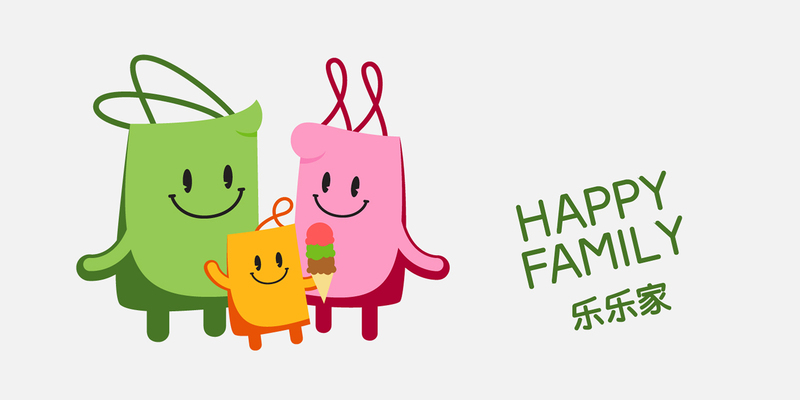 We expanded the “Happy Family” and other key design elements into related areas such as hoarding design and a range of marketing collaterals, all focused on presenting a consistent, friendly and welcoming shopping experience for customers. 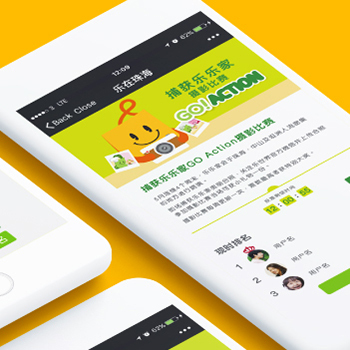 Social media played a major role in marketing the new mall, with a tenant activation campaign on WeChat, China’s most popular social media platform. 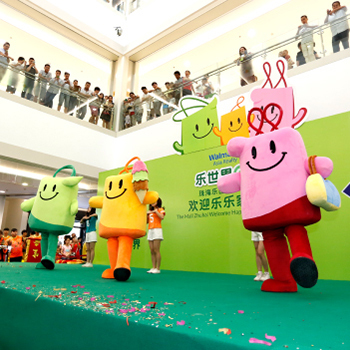 A range of animated icons was devised to appeal to consumers, and a photo contest organized to mark the mall’s opening. 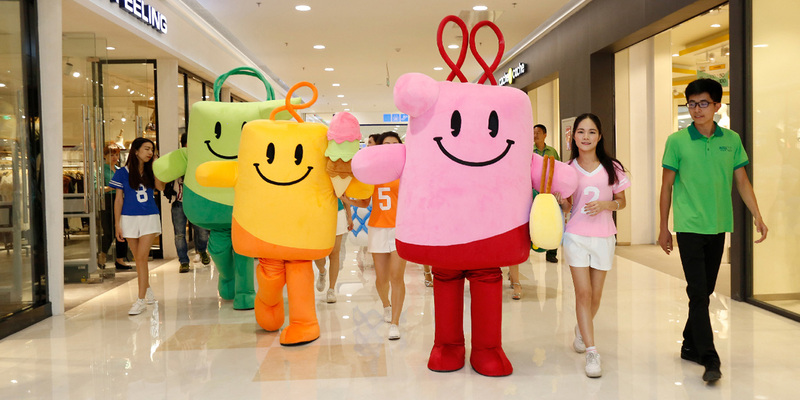 The first branch of The Mall opened in Zhuhai in May 2016. The 110,000 sq. 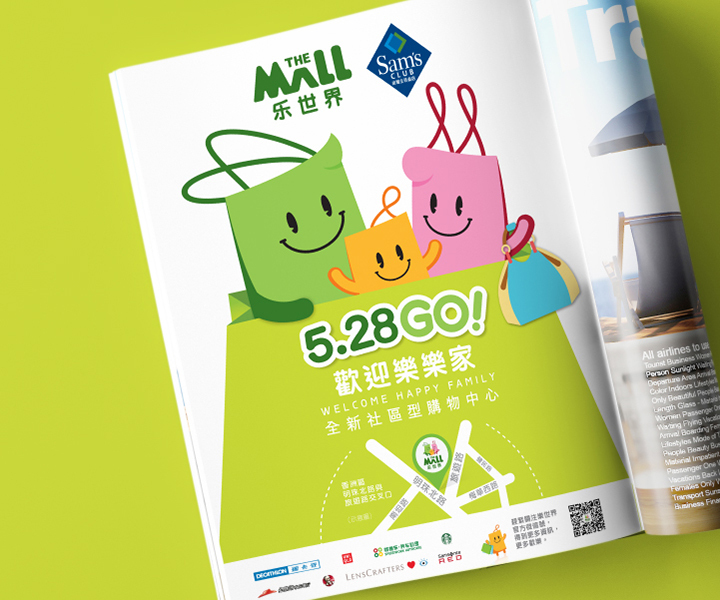 m. Mall occupies 6 floors of purpose-built premises, with 1,800 free parking spaces, and is anchored by Sam’s Club. 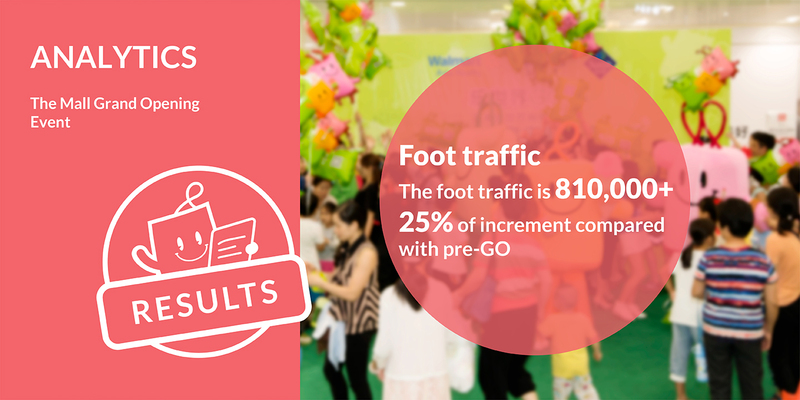 Base Creative organized the grand opening ceremony, attended by 150 VIP guests, including the Commerce Board of Guangdong Province, and an estimated 26,000-people traffic flow. 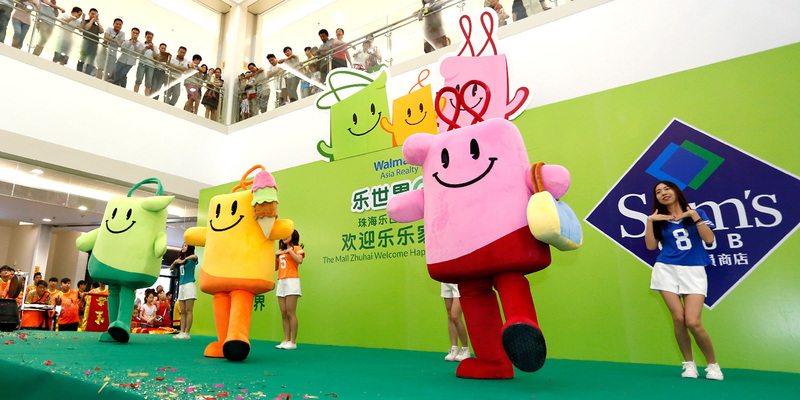 The ground floor lobby of The Mall was transformed into a green land where guests interacted, Walmart Asia Realty President, Peter Sharp, and Sam’s Club COO, Andrew Miles, delivered congratulatory speeches, and the three mascots gave out The Mall-themed balloons to children. 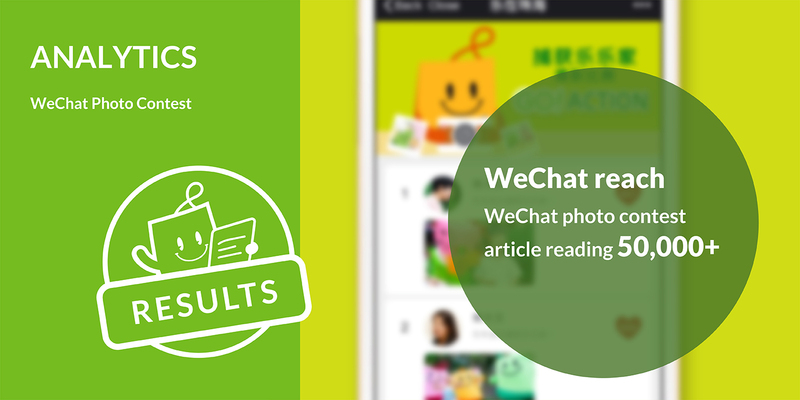 The ceremony ended on a high note with a traditional lion dance and ribbon-cutting to signify good luck and success.